I’ve seen people try to explain away Romans 9, by claiming it was about Israel only, and not individual believers. I don’t agree with them. I’ve seen them try to wriggle out of several other passages in the Bible that to me look like rock solid support for God’s sovereign election. I would be curious though how they get around Acts 9. Let’s take a look at Acts 9. Now, I think you can see that it is just silly to try to say that Jesus was waiting for Saul to ask Him into his heart. 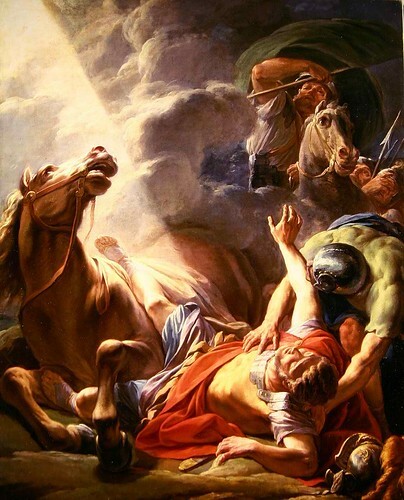 I think it is equally silly to say that Saul wanted to be saved, before the encounter. It also appears obvious that Saul did not have a choice in the situation. We know that he was hunting believers and persecuting the Church. Verse 1 starts out with, “Now Saul, still breathing threats and murder against the disciples of the Lord,” Safe to say, he wasn’t a nice man. He certainly didn’t like Christians. After his encounter with Jesus we read in verse 15 God has a conversation with Ananias, where He explains that Saul is chosen by God. “But the Lord said to him, “Go, for he is a chosen instrument of Mine, to bear My name before the Gentiles and kings and the sons of Israel; (16) for I will show him how much he must suffer for My name’s sake.”” Interesting to see God choose someone who was violently against Him. Then changes his mind and thinking, and turns him into someone usable for His purposes. God used Paul to give us much of the New Testament. So much of our theology is from Paul’s Epistles. So, my freewill friends, how do you explain this one away? I better not hear any of you saying Saul could have refused and God would have just went on to try another man. Supralapsarianism, Infralapsarianism, or Something Else?